When Amira was a little girl in Homs, Syria, she dreamed of becoming an architect. She would play on dusty construction sites and envision majestic buildings sprouting from the ground, drawing her dreams in the sand. Her life has changed greatly since those days, and over time her dreams began to slowly disappear, as though they never belonged to her at all. Amira married at the age of 14. Today, at 17 years old, she is a divorced mother of a seven-month old. Nevertheless, she remains focused on carving a promising life for her and her daughter. Amira’s life, like millions of others in Syria, became turbulent over the past four years. Syria’s civil war has resulted in approximately 220,000 deaths (UN, 2015), and more than 4 million people are now refugees in neighbouring countries (UNHCR, 2015). Amira and her family were forced to flee to Jordan in 2012. Her father passed away in Syria. Today, she lives in Mafraq with her mother, sisters and daughter. The city, which is 80km north of Jordan’s capital, Amman, is one of the many host communities that are bearing the burden of hosting large numbers of Syrian refugees. It is easy to see how much Amira craved close friendships – girls she could be herself around, people she could trust. Although her recent experiences have been overwhelming and traumatic, Amira feels she may finally have a chance to start again. 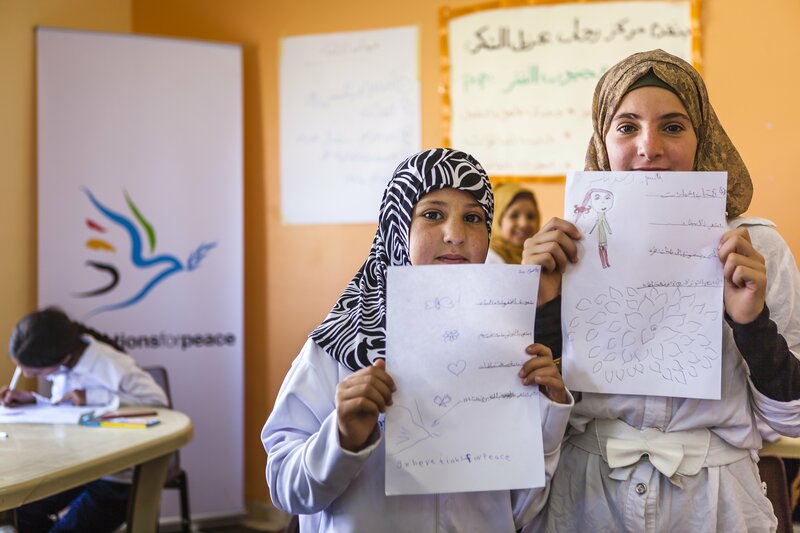 The GFP programme, supported by UNICEF, was designed in response to the increasing number of Syrians seeking refuge in Jordan, and the enormous pressures on both Jordanians and Syrians in host communities. Over a two-year period GFP aims to reach at least 5,000 Jordanian and Syrian refugee children and youth in 12 selected communities most in need. 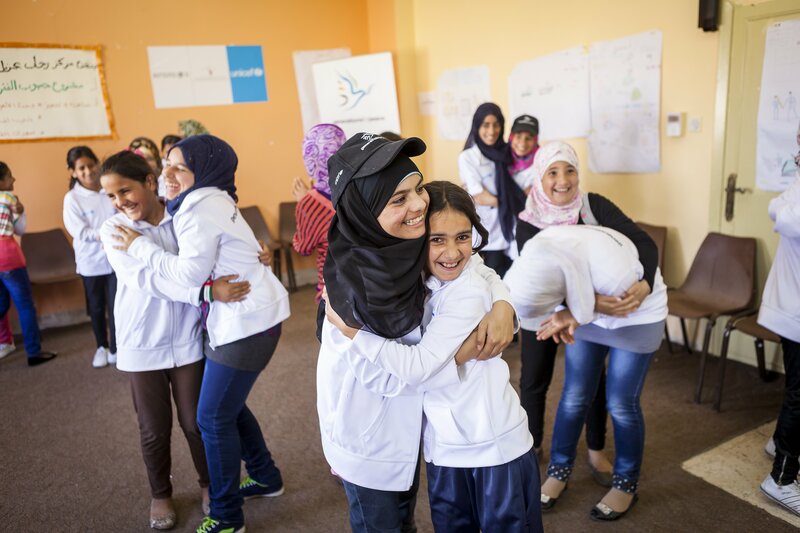 Volunteers on the ground work with youth in Amman, Zarqa, Irbid and Mafraq to encourage greater interaction and inclusion through carefully-designed sport and arts-based activities which promote positive dialogue and lasting friendships amongst youth. The activities strengthen resilience and social capital linkages that are essential to support improved coping mechanisms in these extremely challenging circumstances. It is clear from talking to Amira that the programme also provided a lifeline to the outside world – she can finally be a teenager again. For a few hours every Saturday, she does not think of herself as a young divorced mother. Instead, she is just a regular teenager like every other girl in the room. She has friends, a space where she can flourish – it is an environment she treasures. “Through the GFP activities we became close – we understand, and trust one another,” she explains. Amira would regularly count down the hours until Saturday, the day when she would see her friends again: “I used to prepare myself on Friday!” she says with enthusiasm. Amira’s mother is fully supportive of her participation in the GFP programme and her pursuit of secondary education: “The most noticeable change that my mum witnessed is I used to be quiet but after the programme I started to speak more and more, and I was always telling my mum about my friends and the activities. She was really happy – she didn’t want this to end. She’s also happy that I’m going back to school,” she adds. *The name of the actual individual, and related photos, have been changed to protect their privacy.